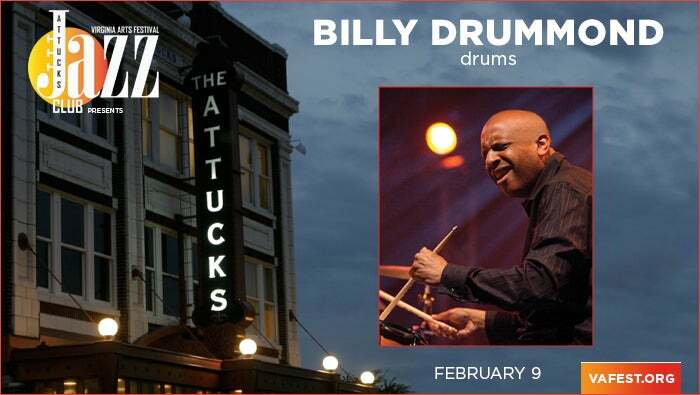 Bandleader, recording artist, with over 300 albums to his credit, educator, and much in-demand sideman, native Billy Drummond is a "thrilling" (Downbeat), "powerful and highly musical" (AllAboutJazz) drummer, known for his "fertile, exciting music" (The New York Times). 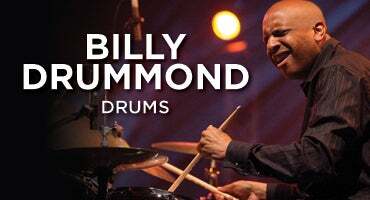 Billy has made three albums as a bandleader--including Dubai, which was picked as the Number 1 Jazz Album of the Year by The New York Times)--and six as a co-leader, including 2016's Three's Company with Ron Carter and Javon Jackson, which made many of the year's Top Ten lists. Born in Newport News, where he grew up listening to his father's extensive jazz record collection, Billy was leading his own bands from the age of eight, and was teaching adults from the age of 14, before going on to study classical timpani and jazz drums at the Shenandoah Conservatory of Music. Billy has performed and recorded with a veritable who's who of jazz, including Sonny Rollins, Horace Silver, Ron Carter, Freddie Hubbard, Joe Lovano, Javon Jackson, Toots Thielmans, Lee Konitz, James Moody, and more. Hear a drummer who “likes to push the limits of jazz, drawing on its traditions while seeking a vibrant, open-doored present" (Newark Star-Ledger).